So called because it's a mix of black and blueberries and my recipe needed a name. 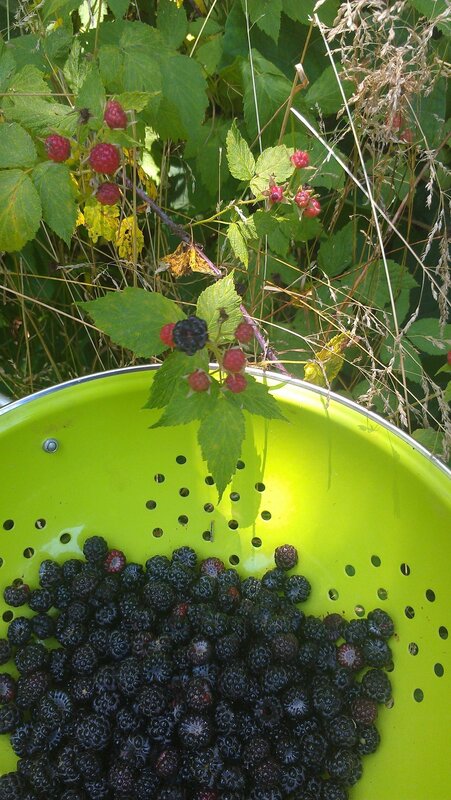 It's a steamy June day here and because my little rooftop wheelbarrow and co. garden was a skillet, I opted to go see about those wild blackberries in the woods across from my house. Many were ripe and I decided to go a-picking. Let it be noted that the pictured Sur le Table apple green colander was once my paycheck splurge and my subsequent Friday night date during my Cincinnati days. You see, Sur le Table was in the same open mall as Whole Foods, I was a graduate student and the colander had been on my radar. As I had been paid my pitance of grad. school salary, I picked up the colander, headed over to Whole Foods, set Sir Granford Smith Colander on the seat across from me (in its giant paper and twine wonderful Sur bag) and felt deeply satisfied. As today, it gathers my requisite berries and our hunt is a success. Now, I wanted to bake something with my gathered berries, preferably something that would also make use of the pint of blueberries in the fridge that needed to find a use, but I also didn't want to bake the fresh blackberries as I felt that something of their wildness might get cooked away. 1. Instead of the lemon yogurt, I did one lemon and one Greek yogurt in the honey flavor. That extra protein just seemed really filling and healthy. 2. I began with a layer of lemon yogurt that I smeared on the graham cracker crust. 3. I mixed the honey yogurt with the whipped topping and gently folded-in my about half of my wild blackberries and the store-bought blueberries. 4. 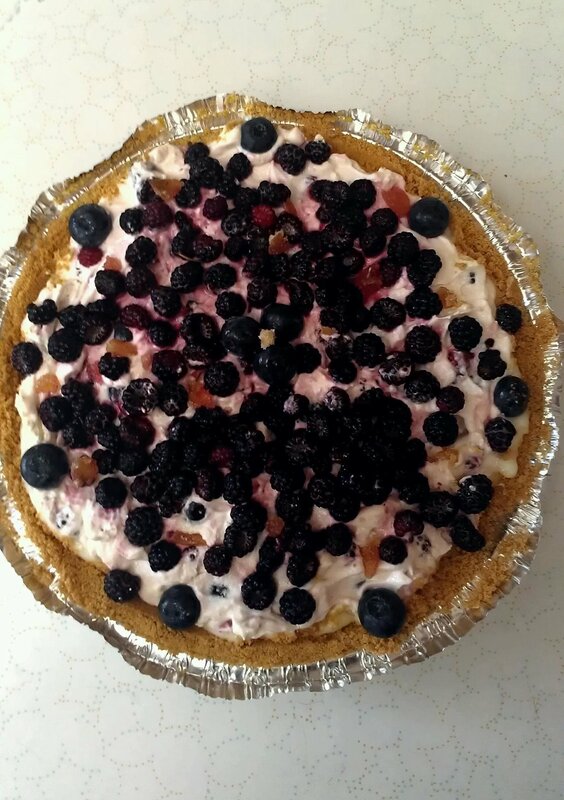 I covered the top of the pie with the remaining blackberries and sprinkled candied ginger slivers over that. We have a lovely, light pie with a nice serving of protein, besides. There are more berries ripening even now. Soon, I try my first jam.